As the son of a dentist, Dr. Sohrab was exposed to dentistry early in life. He saw how his father worked hard to get through dental school and start a practice, and then even harder to make sure he did everything he could to make his patients happy. It gave him real joy when his patients thanked him, whether it was for relieving pain, improving function, or allowing them to smile again. He has even bonded lifelong friendships with many of his patients. Dr. Sohrab realized then that to be a dentist meant treating your patients—the people that place their trust and health in your hands—like your own family. It also showed him that being able to improve the health and lives of the community brings with it a gratification that few other careers can offer. He knew this was what he wanted to do. 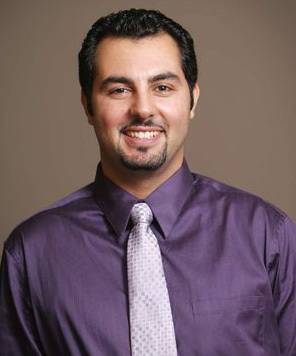 Dr. Sohrab values quality, patient-centered dentistry. He believes it is important to take the time to listen to his patients’ concerns and answer any questions they may have regarding their diagnosis and all pertinent treatment options. He takes continuing education courses to make sure he is providing his patients with the best care possible by keeping up with new guidelines, technologies, techniques, and materials. Dr. Sohrab is a Bay Area native who attended the University of California at Davis and San Jose State University for his undergraduate studies in biology. He received his DDS (Doctor of Dental Surgery) from the University of Pacific School of Dentistry in San Francisco. His father graduated from UOP School of Dentistry in 1988 and still maintains his private practice in Cupertino, CA. His brother, a 2002 UOP School of Dentistry alum, is a resident at UCSF’s Oral and Maxillofacial Surgery program. Dr. Sohrab is a member of the American Academy of Cosmetic Dentistry, the American Dental Association, the California Dental Association, and the Marin County Dental Society. Growing up as a huge sports fan in the bay area, he fanatically cheers for the Giants, 49ers, Warriors, and Sharks. He enjoys spending as much free time as possible with friends and family, including his one-year-old son Cameron. He also enjoys cooking, photography, tennis, and is desperately trying to find the time to start playing golf.